Our guide will be pick you up early in the morning at 08 Am from hotel then drive with modern AC van to send an amazing leisure day in Sharm El Naga bay. 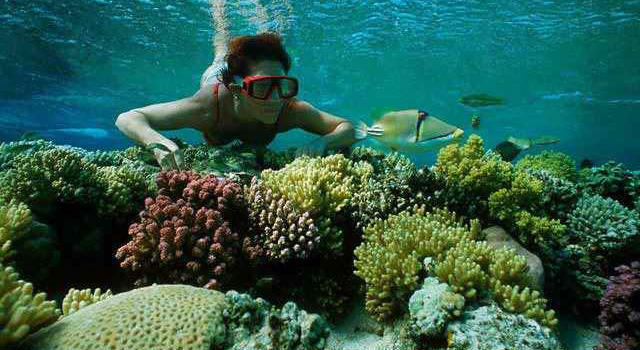 Enjoy that great snorkeling and diving opportunity to uncover the marine life of an untouched Red Sea environment and an ideal place for water sports. You would have the opportunity to play volley ball or enjoy a horse or camel back ride. The playground is prepared to be safe and entertaining for kids and all family members then transfer back to hotel in Hurghada. The Red Sea is located to the East of Egypt with Sinai, the Suez Gulf to the West, and the Aqaba Gulf to the East, at its very top to the North. It passes by the lands of various countries including Egypt, Sudan, Eretria in Africa and Saudi Arabia, Yemen, and Jordan in Asia. Hurghada is perfect for those seeking total relaxation with fantastic weather and warm sea temperatures around the year. Sharm El Naga is 45 minutes south of Hurghada, it is a very popular diving and snorkeling site and perfect for a relaxing day trip.